From an earlier post, I indicated I would post another question that was, "what do fuses protect?" I hope to make an attempt to clearly answer this question, which rarely enters our minds. Understanding the logic behind my answer may help to identify anomalies and also explain some odd choices of fuse you may come across on a day today basis. Why doesn't the UK use AFCI's? 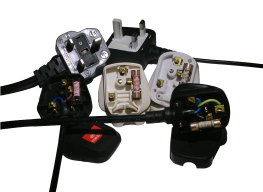 In this post I hope to answer the burning question of, why doesn't the UK include the Arc Fault Circuit Interrupter (AFCI) in their regulations? Actually following the UK naming conventions, I assume they would call them, Arc Fault Circuit Breakers (AFCB) when located within the consumer unit or generically they would be called, Arc Fault Detection Device (AFDD). In a previous post I wrote about types of RCD such as an ELCB, RCCB, and the RCBO. 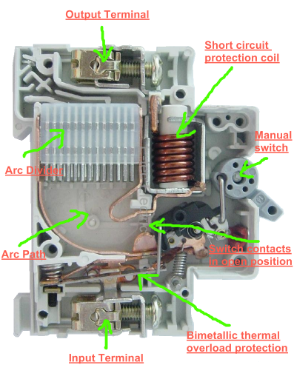 In this post I want to discus other types of breaker you might find in a consumer unit or breaker box. 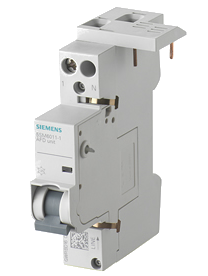 The most common that you might find in Europe is the MCB or Miniature Circuit Breaker. Although the MCB is used as a replacement for fused wire, it is designed to have a number of specific properties. I would like to discuss the makeup of this unit, which is very similar to the Circuit Interrupters as used in the North America. I would also like to discuss the workings of and operation of an Arc Fault Circuit Interrupter (AFCI) AKA Arc Fault Detection Device (AFDD). In my previous post I wrote about what a neutral earth fault was and touched on some methods to diagnose the fault without having to use specialist test equipment. In this post I would like to describe some first and second hand experiences of this condition. I want to described 3 cases that I hope to illustrate how awkward this fault can be to diagnose and locate. It also gives food for thought if you have experienced similar issues.